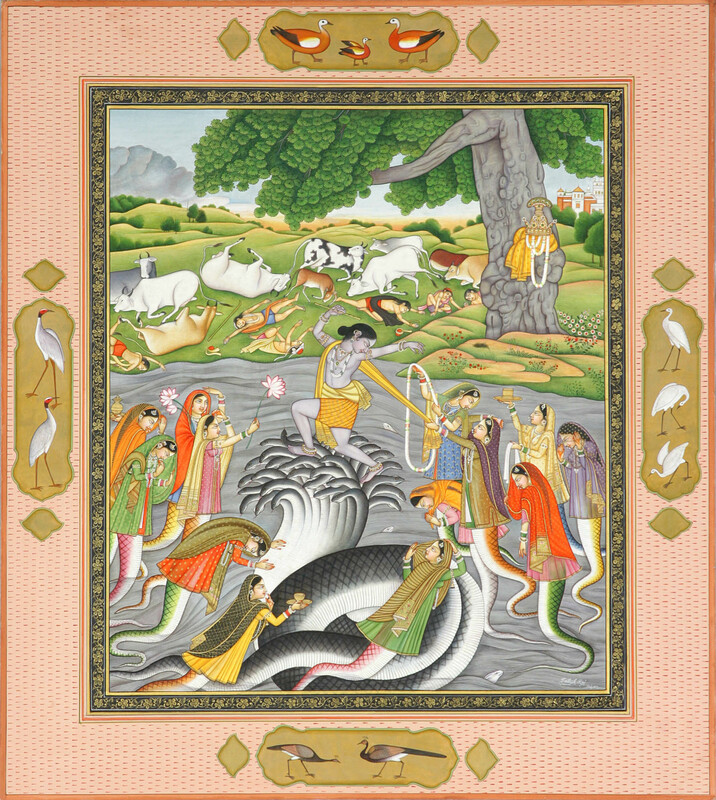 This rare masterpiece, rendered pursuing the Kangra art idiom of Pahari art as it prevailed around 1780-90 under its legendary rural Raja Sansar Chanda, one of the great patrons of art that world has ever produced, represents Lord Krishna subduing the multi-hooded huge venomous serpent Kaliya. Characteristic to Kangra art style, the painting has used a wide range of colours but balanced to breathe an eye-soothing effect. Larger in size and with far greater details than had the early Kangra miniature on the theme, the painting outstands its proto-model. It has wider perspective with a far reaching backdrop, better charged human and animal figures, more elaborate imagery as also the better quality of art. As the textual tradition has it, long before Krishna incarnated, a huge multi-hooded venomous serpent Kaliya had migrated to a remote uninhabited part of Yamuna. Kaliya was a descendant of Pannaga clan of Nagas, one of their five ancient clans. Before migrating to Yamuna Kaliya had its seat at Ramanaka, an island in the mid-sea. One of the territories of the great bird Garuda Ramanaka was often frequented by it. Garuda not only invaded Kaliya’s peace but also devoured whichever of the ‘nagas’ it got hold of. Ultimately Kaliya had a treaty with Garuda under which it presented to Garuda on the last day of every month necessary food as tribute. However, the arrangement was short-lived. Dishonest by nature, Kaliya often evaded honouring the conditions of the treaty. This infuriated the great bird and it began attacking Kaliya. With no option left the serpent decided to give up Ramanaka island and to move to Yamuna. The part of Yamuna where Kaliya settled came to be known as Kaliyadah. In no time the waters around Kaliyadah were so much polluted that not only those who drank it, even those who touched it, and the birds that passed across it in the sky dropped dead. Not the people of Brij, even its cows were afraid of going around Kaliyadah. One of the objectives of his incarnation, Krishna had to liberate Yamuna from the venomous Kaliya. One day, while playing, Krishna deliberately swung his ball towards Kaliyadah. As intended, it fell into waters at Kaliyadah. Before anyone could foresee, Krishna climbed a tree on the river’s bank and jumped from it into the waters of Kaliyadah. The uproar which Krishna created by falling into waters irritated Kaliya and annoyed it rushed to punish the intruder. Initially it caught Krishna in its coils but soon he overpowered the serpent and began tramping it by dancing over its multi-hooded head. Dismayed by the whirl-wind like moves of Krishna’s feet the serpent felt that their pace would suffocate it to death. Subdued it lay under his feet and prayed for mercy. Listening to its prayers its wives rushed to its rescue and prayed Krishna to spare it. Krishna agreed to forgive it on condition that along with its family it would vacate Yamuna and shift to sea, a wider geography which would better accommodate it, and also that it would not indulge in activities that would harm others or damage environment. Besides a powerful and extensive landscape, the painting well illustrates the legend in fuller details. Fainted cowherd boys and cows lying all around suggest that they reached this condition by coming into contact with the poisonous waters of Yamuna at Kaliyadah. Krishna’s peacock-crown, Pitambara and Vaijayanti of white Parijata flowers lying on the trunk of the tree illustrate his act of mounting the tree and jumping from it. The form of Kaliya reveals both, its furious rise as well as its helplessness under Krishna’s feet. Most dramatic is the portrayal of Kaliya’s wives, one of them pulling Krishna by his sash for drawing his attention, others displaying their helplessness and thus appealing for mercy, some imploring Krishna by bowing before him for forgiving Kaliya, others rushing to him with garland, flowers and trays of offering to appease him and the like.